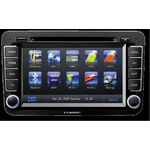 Blaupunkt is a leading brand for car radios in many parts of the world particularly in Europe. Blaupunkt represents quality and innovative power. The company's origins go back to the innovative quality symbol, the blue point, with which the company, founded in 1923, first labelled its headphones. The blue point represents products with excellent quality and technical competence particularly with regard to in-car radio reception and a first class sound. In addition Blaupunkt more and more focuses on components of consumer electronics and currently employs approx. 80 people in the trading business at headquarters in Hildesheim and about 350 in its Malaysian factory. Blaupunkt offers products with excellent quality and technical competence particularly with regard to in-car radio reception and a first class sound. In addition Blaupunkt more and more focuses on components of consumer electronics. We are looking for vehicle manufacturers or distributors, who are interested in customer oriented entertainment solutions, e.g. car radios, navigation or sound.